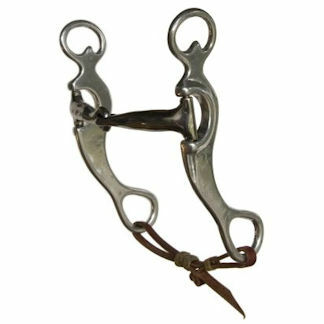 This is a large S piece snaffle bit with 7 1/2 to 7 3/4 cheek piece measured from top to bottom. No pinch where the mouth and cheek meet - there is a sleeve for protectin. The cheek pieces are also aluminum. The mouth piece is 5/8" diameter tapered to 3/8" in the center. It is also bowed with an inlaid copper along the length of the mouthpiece. This is a very forgiving bit and hores accept it very well.